DVD Review: Bill “The Grill” Cooper Escapes! Bill Cooper is one of the top American BJJ black belts; he is under Ricardo “Franjinha” Miller training with Team Paragon BJJ. This DVD is primarily about escapes; the escapes that Bill teaches are shown with a transition to a dominant position or a submission of your own. He starts off stuck in a submission and proceeds to make his opponent pay for it. He explains every escape in full, twice. Each explanation would stand alone with enough detail for you to understand the move. At first this threw me off, I kept thinking he was going to show a different technique. After I caught on to this, it was nice because I would listen for little differences and pick up smaller details. After the double explanation, each move is shown with a few different angles. This DVD is a nice break from most of the BJJ DVDs that I have because it focuses on defense. It seems like there are a lot of DVDs that show you submissions and sweeps, but the defense aspect is often lacking. For that reason alone I like having this DVD in my BJJ library. What is on the DVD? 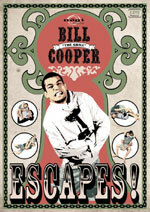 Like the name says, Bill shows escapes and not the basic ones everyone has already seen. He is not showing the common mistakes that may have gotten you in this submission or bad position. He is not showing you how to play it safe and not make mistakes. He shows the techniques that he likes to use when he is in a bad spot. Most of the escapes end in a submission of your own, if not you will at least end up dominant. He shows escapes for: Armbar X4, Triangle X3, Rear naked choke X2, Omo plata X1, Back X4, Crucifix X3, Body triangle X2, Leglock X5, Guillotine X1, Shaolin (Darce) X4. The DVD is 86 Min, with a little bonus footage of him on “Rolled up”. The most common submission he shows after his escape is the Darce choke. If you like the Darce choke I am sure you will pick up a few new tips. What I got out of it. I learned a lot of cool escapes that I have never seen before. I am still at the place where I am happy to break free from the submission. I would happily transition to an attack but that seems easier said than done. Also I did pick up some good details on finishing some submissions. The two techniques that I really liked the most are the “bigfoot” triangle escape and the “sewer escape” for the guillotine. I would recommend this DVD. I would say this DVD is great for anyone blue belt and above. The escapes shown are not your basic and standard escapes. I think white belts are better off learning the basic escapes and adding these techniques later. There are also a few submissions that he assumes that you understand, again blue belt and above will be fine. The DVD is all no-gi, but most of the techniques will work for BJJ. If you get this DVD I recommend starting from some of these bad spots while rolling, that way you can be sure to work the new techniques into your game. This entry was posted in Reviews and tagged bill cooper dvd, bill cooper excapes, Bill the grill cooper, BJJ dvd, bjj dvd review, Submission defense by byronjabara. Bookmark the permalink.